So in an effort to conquer the overtired mummy to nocturnal screaming baby and be inspired mummy to big school boy I have started setting up activities earlier in the day for Oz to do after I collect him when I’m likely to be in zombie mode. One of the more recent was a treasure hunt. I hid clues around the house in a chain they were really simple as has never done anything like this before as he gets more confident I excpect we’ll have trickier clues. 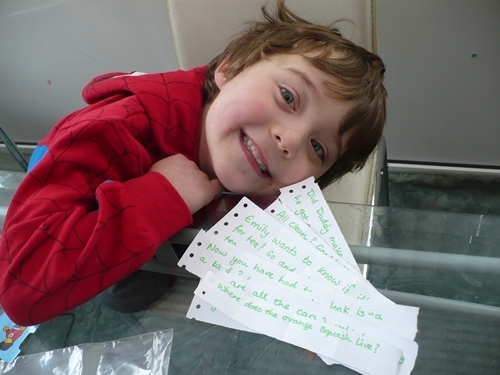 I loved treasure hunts as a kid and would love him to remember them too. 2 (in the lego bus) Emily wants to know if it’s tea time. Check out her tea pot. 5 (under the mat) did Daddy make his bed this morning? 6 (on Daddy’s pillow) Did you put all your McQuuen cars away? 7 (in the mqueen car carry case) where do we keep the orange squash? 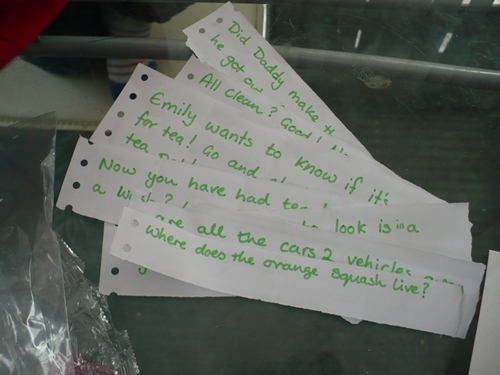 8 (tucked under label of orange squash) is Auntie Susan in her bed? 9 (right down in the bed) it’s under your chair! 10 (under the chair) Knitted Mario has your prize in the den under the bed! 11 (under the bed) Now you make the lego man and then you can use your new pens to do your letter sheet. No complaints about the homework sheet that day (and indeed the new pen glamour lasted nearly a week).